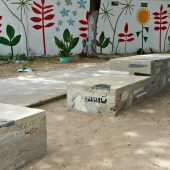 Rubble Masonry – Jardim Brasil, Recife / Olinda, Pernambuco (Brazil) 2017. Throughout Recife it is common to find residential construction waste dumped in public spaces. In considering creative ways that construction waste could be cleared and reutilised, we became interested in the desert masonry forms created by Frank Lloyd Wright and his apprentices at Taliesin West. This construction approach showcases how freely available local materials could be incorporated into masonry forms using non-professional labour and a simple process to produce aesthetically unique results. 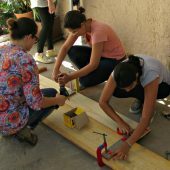 A weekend prototyping workshop in the community square of Jardim Brasil 1 was run to test these desert masonry techniques in a real context. 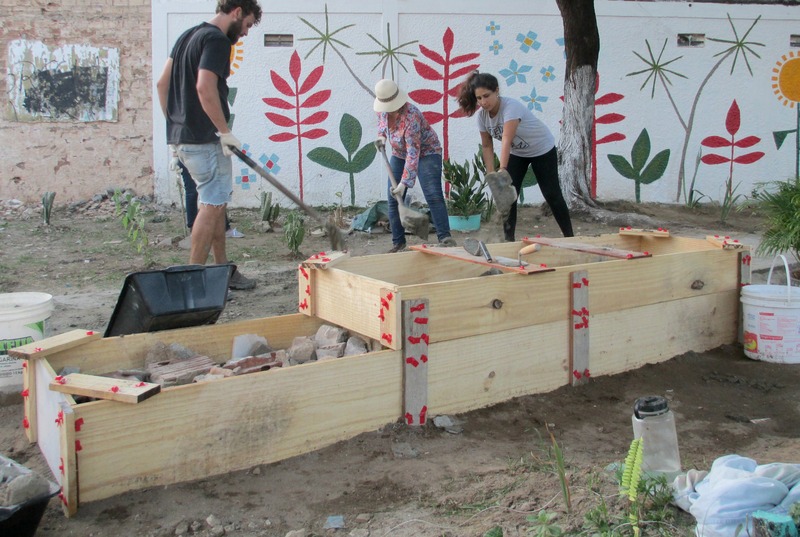 The workshop forms part of an ongoing series of interventions in the public space. The design prototyping process involved collectively developing ‘insight statements’ (from the IDEO Human Centred Design approach) about the space, generation of design focus questions and brainstorming to explore ways that low height solid forms best contribute to the space. The feedback process was guided by local residents who also contributed greatly to the construction process. 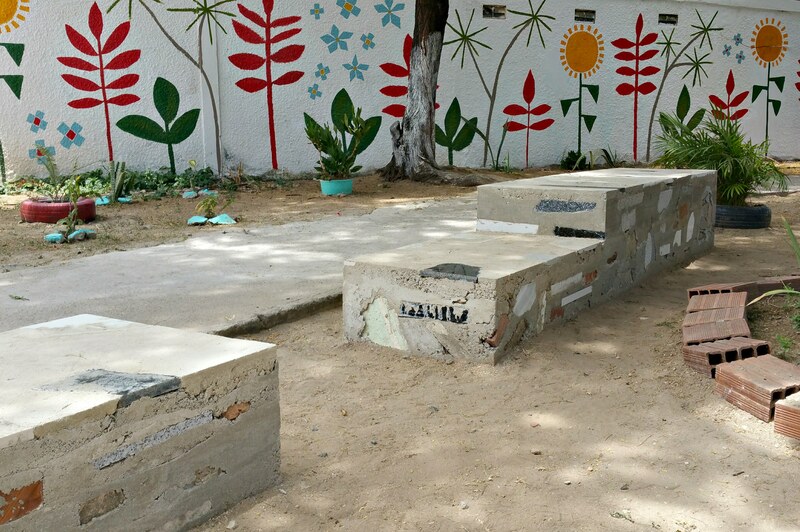 Children from the local community were involved to make concrete artworks which were incorporated into the final masses. A variety of local rubble was used to fill the forms together with the concrete mix. This included marble offcuts, tiles, bricks and concrete render. A week later, after much anticipation, the formwork was removed to reveal the final form. Through the physical forms and local publication it is hoped that the idea could be applied adapted in other similar community spaces. Client: Jardim Brasil 1 local community, Alexandre Carvalho Pereira de Souza, José Eduardo Oliveira de Araújo, Juliana Oliveira Pessoa de Araújo. Tutors: Michael Phillips, Rachael Carter, Natan Nigro, Lula Marcondes. 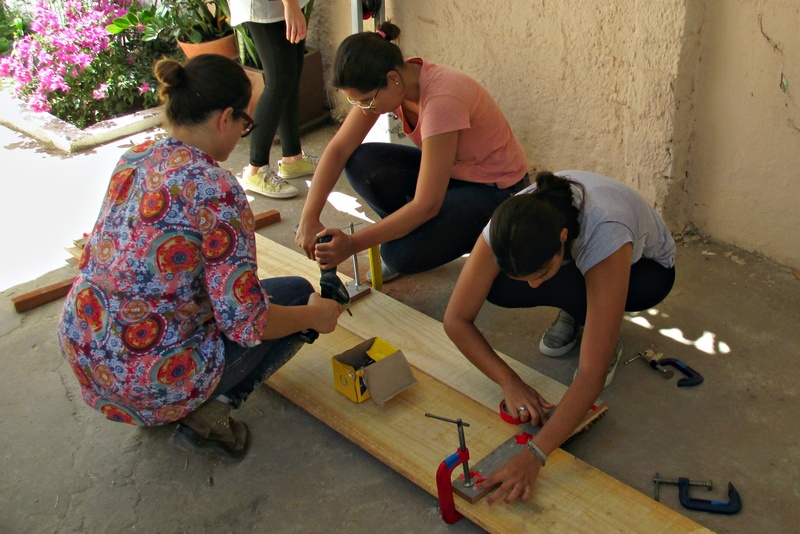 Students: Joyce Suruagy, Ingrid Lima , Aline Nascimento, Maria Eduarda Viana , Lucas Izidorio Medeiros da Silva, Pedro de Andrade Lima Britto , Victor Uchoa Cavalcante de lima , Melina Rattes Lima da Motta. 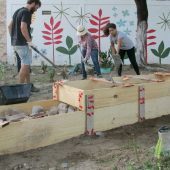 Research question: How can we reuse local salvage construction materials to create solid platform interventions that contribute to the qualities and existing activities of the space?